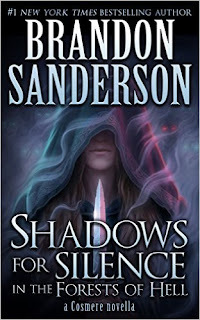 Brandon Sanderson is one of my favorite authors these days and I just found out that he released this novella Shadows for Silence in the Forests of Hell a while ago and I somehow missed it. My favorite thing about novella length fiction is being able to sit down and read the entire thing in one session. This one was no exception. I read through the novella in one night and really liked it. 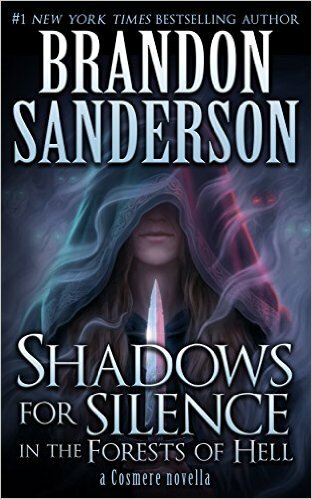 Sanderson creates a new world with a new system of magic and superstition, as he usually does. It's always interesting to see which direction he takes it. In this world it seems to be built up around puritanical belief systems. I'm not a person that likes too much religion in my fiction, but Shadows for Silence in the Forests of Hell does a great job of using it as source material but not lingering on it. The story follows Silence, a character who owns a waystop along a dangerous road through the forests and the White Fox, a bounty hunter who tracks people down in those same forests. It didn't take long for the story to grab me and pull me along all the way through the end. If you're interested in novella length fiction or an author who does some of the best world-building you should definitely check it out. I actually found a link to a snippet you can read for free right now. 'Tis indeed a most excellent story. I always love to see his worldbuilding in a new setting.